If you’re a homeowner in an area of the US that sees a lot of snow during the winter, it’s not if but when you’ll experience your first ice dam. This thick buildup of ice begins at the edge of the roof and grows upward toward the ridge, sometimes covering as much as 10 feet of shingles. One of the major causes of ice dams is hot air from your home leaking through the attic and melting the snow above. The water then begins to travel down the pitch of your roof and refreeze once it hits the frozen ice that collects near the eaves. When left untouched, the process will continue during cold temperatures and cause a large amount of ice to accumulate at the edge of your roof. Over time the weight of the ice will grow and might even cause parts of your roof to collapse. By reducing the amount of hot air that leaks through your roof, you can reduce the chance that leaking heat will begin the melting process. You should also check to make sure you don’t have any leaking roof skylights. 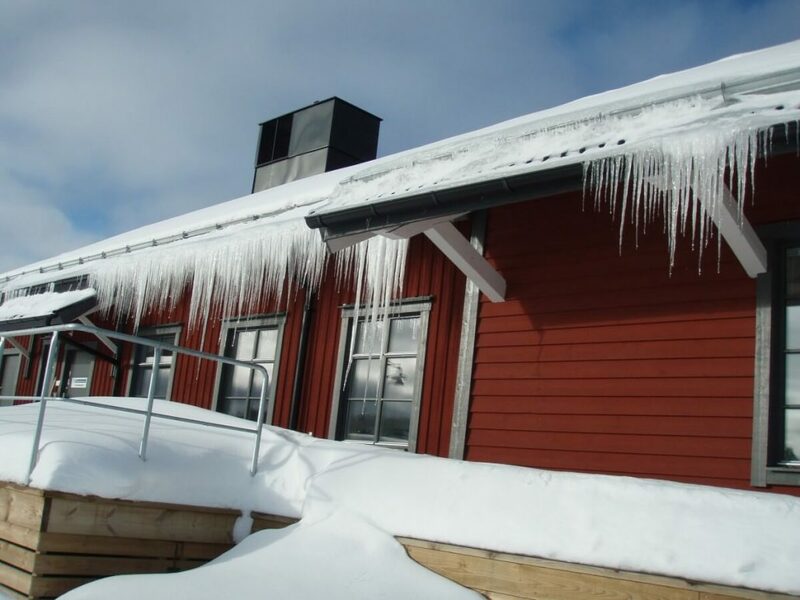 Even reducing air leakage by 20-30% can often be enough to prevent ice dam buildup. Patching up your attic is a great first step in preventing a roof ice dam, but your home’s insulation is just as crucial in ensuring your attic remains at an ideal temperature that won’t encourage the formation of ice dams. Be sure that your attic has proper insulation so that it remains at a consistent temperature during the winter months and keeps heat inside your house. During the harsh winter months, it’s important that you clean your roof as often as is safe, especially your gutters. If your gutters are filled with debris, the water has no way off the roof, which can cause a significant buildup of ice. Winter storms have a knack for happening at the worst possible moment, so don’t wait until your roof is covered with snow to clear out the gutters. Additionally, taking a tool or shovel to your roof to wipe off excess snow will reduce the chances of an ice dam forming. If it’s not safe or possible to remove all the condensation from your roof, aim to clean off at least the lower 3-4 feet of the eaves where snow has begun to pile up. Another effective way to prevent ice dams is by having a professional contractor install heating cables on your roof to melt the snow. Additionally, you can apply one of a handful of hardware store products to your roof’s surface that will keep ice from forming in the first place. While the white winter months can be enjoyable, dealing with ice dams is never fun. If you are worried about an ice dam forming on your roof, the best thing you can do is give us a call here at Nelson Contracting. We’ll work with you to ensure your roof is structurally sound and prepared for the weight of ice and snow. While you can perform regular upkeep of your roof yourself, having a professional assist you can help keep you safe and prevent unnecessary and potentially dangerous mistakes. Give us a call today!